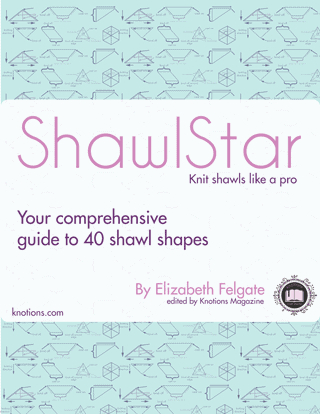 I was recently asked by the wonderful Jody at Knotions to review the new Shawlstar book by Elizabeth Felgate, many of you on Ravelry will know her designs. I love her Gaugeless range of sweaters and cardigans designed for any yarn weight. Liz has an amazing eye for both colour and texture and whether you’re an experienced shawl knitter or a newbie, you’ll absolutely love this book. Liz is known for her attention to detail and this really shows in the book, there’s a great deal of thought gone into making it easier for the knitter and to ensure any instructions are well explained before you start. There are lots of gorgeous photos and plenty of hints, tips and advice to take you through your shawl project. There are more than 40 patterns in the book and I think it’s an absolute bargain at $19.95 (plus VAT if you’re in the EU). That’s less than $0.50 per pattern. If you’re unfamiliar with Knotions, they’re an online publisher of knit and crochet patterns and their website is a virtual treasure trove of goodies including articles and some fabulous tutorials. The book is being updated to add some gorgeous new shawl shapes on 23rd March and you can buy it here. (In the interests of transparency, this is an affiliate link and I’ll receive a small percentage from the sale of the book, it won’t affect the price you pay). The ebook itself has over 60 pages of shawl design recipes you can customize to your yarn/gauge and get the size you want. There are over 40 shawl shapes for you to try and they’re clearly explained with examples so you understand easily how each one works. I love the new shapes which are being added on 23rd March and swatched a couple of them so you could have a quick preview. One of the things I liked is that each shawl shape included in the book has a list of pros and cons for that shape, I found that really helpful. I love the layout of the book, nice and clean, easy to read fonts and well formatted. Of the new shawl shapes, Rainbow has a little bit of maths to do before you start, but they’ve included a brilliant spreadsheet to do the work for you (easily accessed online). How utterly cool is that? How does all of this help someone who’s never knitted a shawl? Well, it means you can use any weight of yarn, you just type in the stitches and rows per inch, the intended size of your finished shawl and the calculator does the rest for you. Flourish and Harpoon have a fill in the blanks option so you can easily record the number of rows, sts or repeats (depending on the design) and print them out whenever you need them. No need for scribbled notes all over your printed pattern every time you use it. I picked up some 5mm needles and some aran weight Creative & Filz yarn in the Rainbow colourway for this shawl as I just couldn’t resist adding some bright, rich colours to this pretty shape. The shawl recipe in the book includes options for this version which is four segments, you could use six so the shawl crosses over at the front or eight segments for a circular version. The spreadsheet calculator worked perfectly and made it so easy to change the depth/height of the shawl and the width, very clever! Next up is Flourish, this is such a beautiful, sweeping shape and the asymmetry called to me. Again I used the same yarn and needles and soon had this beauty. I can’t wait to play around with this shape and see how it works with a variety of yarns. Self striping yarns like this one, or stripes to bust some stash would really help show off the unusual shaping. Those of you who know me, will know I’m not usually one to gush or rave about something. But, I do love the Shawlstar book, it’s full of clever ideas, inspirational shawl shapes and lots of helpful advice. Shawlstar makes me want to sneak off work and spend the rest of the year knitting shawls.